The Sermon at the Consecration of Horatio Potter, D.D., to the Episcopate, Preached by Appointment, in Trinity Church, New-York, on Wednesday, November 22, 1854. By Francis Fulford, Lord Bishop of Montreal. New York: Church Depository, 1854. A Letter to the Right Rev'd Horatio Potter, D.D., LL.D., Bishop of the Protestant Episcopal Church in the Diocese of New York, Relating to the Proceedings Pending against the Rev. Stephen H. Tyng, Jr.
Washington, D.C.: Gibson Brothers, 1868. Publications of the American Church Union, No. 1. The Tyng Case. A Narrative, together with the Judgment of the Court, And the Admonition by the Bishop of New-York. Published by the American Church Union New-York: Pott & Amery, 1868. Publications of the American Church Union, No. 2. Speech of Stephen P. Nash, Esq., For the Prosecution, in the Trial of the Rev. S.H. Tyng, Jr. Published by the American Church Union. New-York: Pott & Amery, 1868. Report of the Committee of Investigation in the Case of Rev. Edward Cowley. June 6, 1881. New York: A. Livingston, 1881. An Introductory Sermon, preached in St. Peter's Church, Albany, on Sunday Morning, May 12, 1833 Being the Day After His Institution As rector of Said Church. Albany: Packard and Van Benthuysen, 1833. Importance of Liberal Tastes and Good Intellectual Habits as a Provision for Pure and Permanent Enjoyment: Being an Introductory Lecture, delivered on the 5th December, 1837, before the Young Men's Association of Troy. Troy, New York: Tuttle, Belcher & Burton, 1837. Intellectual Liberty; Or, Truth to be Maintained by Reason, Not by Physical Power: A Discourse Preached in St. Peter's Church, Albany, on the 26th of November, 1837. Albany: Packard and Benthuysen, 1837. Discourse on the Death of William Henry Harrison, Late President of the United States: Delivered before the Two Houses of the Legislature of the State of New-York, in St. Peter's Church, Albany, on the 25th day of April, 1841. Albany: Printed by Hoffman, White and Visscher, 1841. The Stability of the Church, as Seen in Her History and in Her Principles: A Sermon, preached in St. Peter's Church, Albany, on Sunday, the Twenty-third Day of July. Albany: Erastus H. Pease, 1843. Rightly Dividing the Word of Truth: A Sermon, on the Religious Tendencies of the Age, and the Consequent Duty of the Christian Minister. Preached in St. Peter's Church, Albany, on Sunday, Nov. 23, 1844. Albany: Erastus H. Pease, 1844. Remarks in Favor of Free Churches: Being Part of an Address delivered on the Occasion of Laying the Corner Stone of a Free Church at Fort Edward, Washington County, N.Y.
Albany: Erastus H. Pease, 1845. Submission to Government: The Christian's Duty: A Sermon for the Third Sunday after Easter. New York: Stanford and Swords, 1848. Christian Suffering, Its Dignity and Its Efficacy: A Sermon Occasioned by the Death of the Hon. Ambrose Spencer, and Preached in St. Peter's Church, Albany, on Sunday, March 19, 1848. A Tribute to the Memory of a Faithful Public Servant: A Sermon on Occasion of the Death of President Taylor. The Duties of Justice as They Affect the Individual and the State: A Sermon. Albany: Weed, Parsons and Co., 1850. Free Will Offerings with An Holy Worship: A Sermon Preached at the Consecration of St. James' Church, Syracuse, November 15, 1853. The Minister of Christ Not of the World. A Discourse Delivered in the Chapel of the General Theological Seminary, N.Y., Dec. 16, 1855, Being the Third Sunday in Advent, on Occasion of the Annual Matriculation. New York: Pudney and Russell, 1856. A Pastoral Letter to the Laity of the Diocese of New-York, on the Duty of Making a More Just and Adequate Provision for the Support of the Parochial Clergy. New York: Pudney and Russell, 1857. Remarks on Confirmation, or Duties of Pastors and People in Reference to the Use of the Means of Grace. New-York: Thomas C. Butler, 1857. To the Clergy and Laity of the Diocese of New York. [New York:] no publisher, 1860. Bishop Potter of New-York to Strangers Arriving from Foreign Parts, and to the Dispersed Members of the Episcopal Church in the Diocese of New-York. [New York:] no publisher, c. 1860. [New York:] no publisher, 1861. A Sermon Commemorative of the Life and Services of the Rev. Samuel H. Turner, D.D., Late Professor of Biblical Literature in the General Theological Seminary. Preached in St. Peter's Church, New-York, October 8th, 1862, by the Rev. Samuel R. Johnson, D.D., to which is Prefixed the Address Delivered at the Funeral, December 24th, 1861, by the Rt. Rev. Horatio Potter. New York: Edward O. Jenkins, 1863. A Form of Prayer to Be Used in the Diocese of New-York, on Thursday, the Thirtieth of April, A.D. 1863. [New York:] no publisher, 1863. A Pastoral Letter to the Clergy of the Diocese of New York from the Bishop. [New York:] no publisher, 1865. The Pastoral Letter of the Rt. Rev. Horatio Potter, D.D., LL.D., D.C.L., and Its Assailants. Reprinted from the American Quarterly Church Review for October, 1865.
Review of "A Pastoral Letter to the Clergy of the Diocese of New-York, from the Bishop." The Pastoral Letter of the Rt. Rev. H. Potter with the Replies of the Rev. S.H. Tyng, the Rev. E.H. Canfield, the Rev. 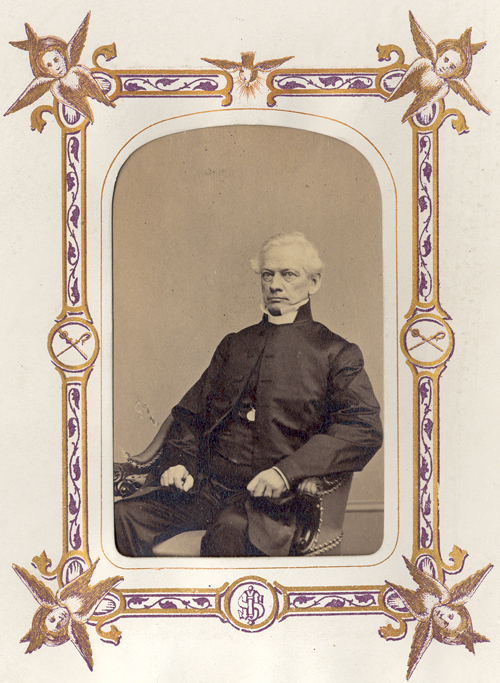 John Cotton Smith, the Rev. W.A. Muhlenberg. New York: John A. Gray & Green, Printers, 1865. The Light of the World: A Sermon Preached at the Consecration of the Right Rev. Henry A. Neely, D.D., as Bishop of Maine. New York: F. J. Huntington and Company, 1867. Annual Address of the Bishop of New York Delivered in S. Paul's Chapel, New York, on Thursday, Oct 1st 1868. A Pastoral Letter to the Clergy and Laity of the Diocese of New York. New York: Pott & Amery, 1869. Sermon Delivered at the Opening of the Primary Convention in the Church of the Holy Trinity, Brooklyn, N.Y. November 18th, 1868. New York: American Church Press Company, 1869. Sermon Preached at St. Peter's Church, Albany, at the Opening of the Primary Convention of the Diocese of Albany, Wednesday, December 2, 1868. Albany: Charles van Benthuysen and Sons, 1869. Considerations for a Candid Mind Inquiring after Divine Truth. New York: Pott, Young & Co., 1871. Some Observations on Science and Revelation: From the Episcopal Address to the Convention of the Diocese of New-York, 1873. New York: Pott, Young & Co., 1873. Faith in the Seen and in the Unseen. A Sermon Preached at the Consecration of St. Thomas' Chapel, New York, on the Feast of St. Thomas the Apostle (Saturday, December 21, 1872). New York: St Thomas Association for Parish Work, 1873. A Letter from the Bishop of New-York, on the Proposed "Church Congress," Appointed to be Held in the Week of the Opening of the General Convention. New-York: J.W. Amerman, printer, 1874. Address Delivered at the Annual Commencement of Union College, june 23d, A.D. 1875, by Horatio Potter, D.D., LL.D., D.C. L. (Oxon. ), Bishop of new York, An Alumnus and Honourary Chancellor of Union University. Troy: William H. Young, 1875. A Few Plain Truths and Serious Counsels for Young Men Preparing for the Sacred Ministry of the Church: An Address by the Bishop of New York to the Students of the General Theological Seminary, Delivered in the Chapel, on occasion of the Annual Matriculation, All Saints Day, Nov. 1st, A.D., 1879. New York: Styles and Cash, 1879.